When will be Outback Pilots next episode air date? Is Outback Pilots renewed or cancelled? Where to countdown Outback Pilots air dates? Is Outback Pilots worth watching? Suspended in mid-air, inches from hivoltage power lines, these deathdefying pilots have an incredibly tough job to do. From working on remote power line transmission towers and hovering just inches from the live wires, to dropping off farm workers into croc-infested swampland for crocodile egg collection.From providing 24-hour aeromedical emergency services to remote and regional residents, to bombing the bushfire flames with thousands of litres of water or foam from above, during Australia's hot, dry summers.They are Australia's Outback Pilots, men and women risking their lives through some of the most inhospitable terrain on the planet. Out here only one thing matters, getting there and back alive! It's master and apprentice when Grant teaches son Matt the dangerous game of mustering, and Ash takes on 230,000 volts of electricity in a high wire act of precision flying. Father and son mustering team Grant and Matt clash with some tough cattle - and each other. Power line pilots Alex and Mick battle strong winds and high voltage power-lines. Tony fires up his flying machine in a desperate hunt to save his farm and chopper pilot Chris fights fire with fire on a precision bombing raid to protect an island paradise. In the Northern Territory, a police air unit tries to stay under cover and on target. Meanwhile, a long-distance ocean rescue pushes the 5-10 crew to the edge. Outback Pilots next episode air date provides TVMaze for you. 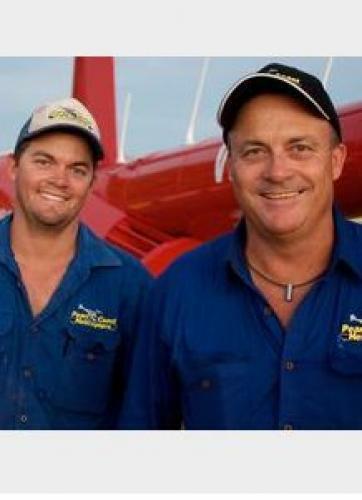 EpisoDate.com is your TV show guide to Countdown Outback Pilots Episode Air Dates and to stay in touch with Outback Pilots next episode Air Date and your others favorite TV Shows. Add the shows you like to a "Watchlist" and let the site take it from there.